Long considered one of the Riviera's most beautiful beaches, Paloma Plage on St-Jean-Cap-Ferrat is the place to go for complete relaxation. Even the waves are small and discreet on this classy cove where pine-covered hills shelter the beach from wind. Located on Scaletta cove, the view east of steep cliffs rising from the bay of Beaulieu-sur-Mer is stunning. Only 150m long, the beach is composed of sand, gravel and small pebbles that are relatively easy on the feet. Paloma Beach (tel 04 93 01 64 71) is the private beach-restaurant, open for lunch from Easter through the end of September and dinner from late May to early September. It is the beach experience of choice for the summer residents of Cap Ferrat who include some of the great fortunes of France. Whether to enjoy a lounge chair and umbrella (around €25) or to dine, a reservation is essential during the summer. Evenings are often given over to private parties. The beach restaurant has valet service and even a shuttle from town. The rest of the beach is open to the public. A lifeguard is stationed at the beach-restaurant in season and there are public showers and toilets. Various watersports are available including water skiing and jet skiing. Rentals are at Paloma Beach. 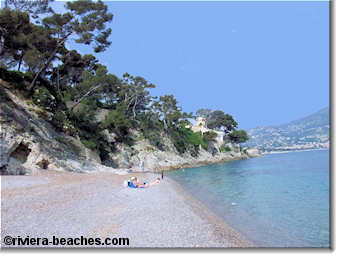 Paloma Plage is at the foot of a steep hill. There is some parking along the road over the beach and then steps leading down to the beach. Bus 81 stops at "Port de Saint Jean" which is the stop closest to the beach. 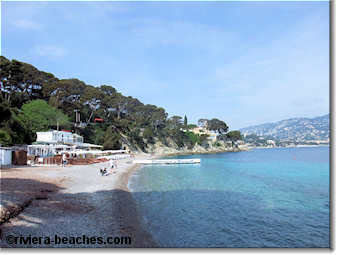 Taking the Cap-Ferrat coastal walk to Saint-Hospice leads you right to the beach.